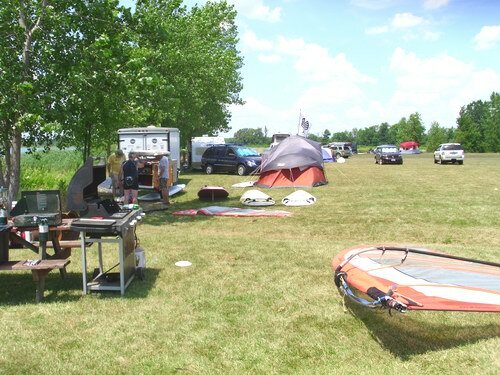 The second annual July 16, 17 Reservoir Rendezvous Regatta at the New London Ohio Campground was once again a smashing success. Lots of spouses, kids and non-racers joined the windsurfing water fun along the big non-swimming beach area. Lunch captain Carl Rappaport served up lunch wraps and a Saturday evening barbecue along with Sunday morning breakfast treats. A $10 entry fee and $15 food ticket along with a camping discount that weekend for windsurfers put smiles on faces. Thanks much to the City of New London for sponsoring some very nice award trophies. 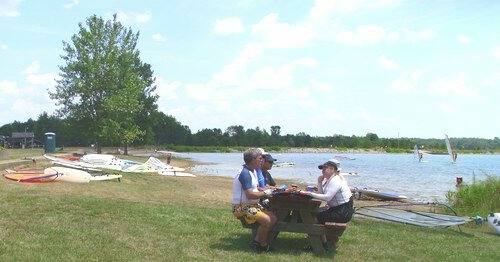 Also thanks to campground manager Nellie and crew for setting the area up nicely and putting up with us. About a dozen people arrived late Friday afternoon and got camp tents set up. Some even got a few practice runs in. More arrived early evening and all enjoyed a Friday night campfire party. ﻿﻿﻿ Saturday evening the group set around a big campfire under a full moon reflecting off the lake. The gentle breezes blowing got a couple windsurfers on the water for moonlight sailing. Sean B. wowed the crowd with his log rolling skills. The kids played with bug zapper rackets and burned up plenty of marshmellows. 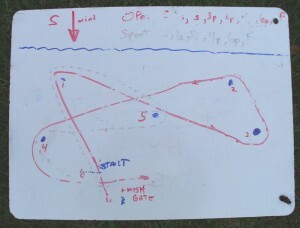 Saturday six races were ran on a course that we call the New London Twisted Eights. With the start line, final jibe mark and finish gate located right infront of the beach area spectators, spouses and kids had a great view of the action. Great shifty breezes and puffs that got you up on a plane for twenty seconds made it exciting. 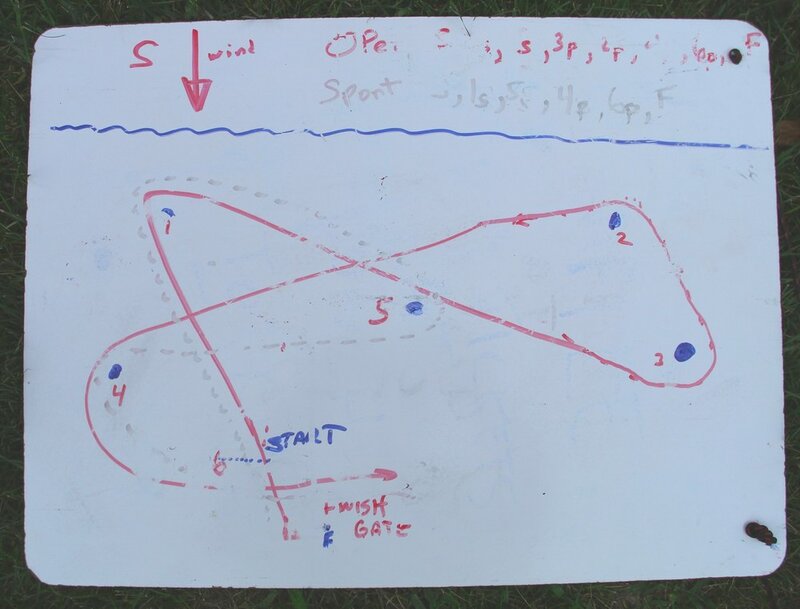 The event saw it’s first Original Windsurfer One Design start with four Original Windsurfers on the course. There were lots of takers demo riding the Original Windsurfers Ted Schweitzer brought with him. Claudia from the Netherlands blazed around the course one race on an Original and had a great time meeting new American windsurfer pals. Sunday we awoke to a thick fog that lifted around 10. The first race got under way around 10:30 in light air that went to near calm conditions shortly into the race. Several managed to finish a 40 minute pumpathon. The wind came back a little but everyone was wore out and extremely hot after that first race. The weather changed from nice to heat dome mode around noonish so it was time for the awards. A link to more pictures should be coming. Hope to see more of our GPWC and TABA friends next year. The BONCs and COWS are ruling that twisted eight course.